All of the designs that are featured on this page are personal commissions. Almost any non-copyrighted design, colour scheme or size can be done, and we are happy to take commissions for personalised giftware for birthdays, weddings, christenings, anniversaries... The possibilities are endless. If you are interested in a custom design or personal commission, you should contact us using the special online form in the first instance. We will then email you to discuss your requirements. Once everything has been arranged a quote will be generated and emailed to you, along with an order number and PayPal link to facilitate easy online payment. For more details on payment options, click here. To view a thumbnail, hold mouse over an image number below. To view a larger image, click the image number. 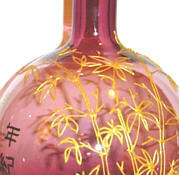 Bamboo design in gold outliner and pen on a purple vase. This vase was an anniversary present and the Chinese text says "33rd anniversary". 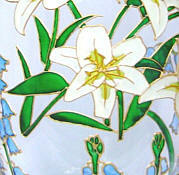 Tall clear vase with a striking lily and bluebell design in gold outliner, ordered and commissioned for a birthday gift. 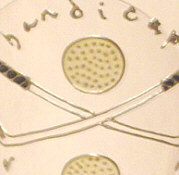 Golf clubs and balls design with the words "Handicap dropped yet?" in silver outliner on a goblet with a golf ball-shaped stem. Glittery pink glass heart with the words "To My Friend Maria" in gold outliner, with a silk cord for hanging. 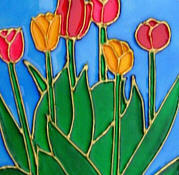 60th birthday card with red, pink and yellow tulips in gold outliner, with personalised greeting. 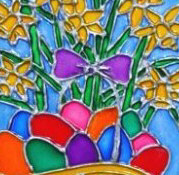 Easter card with basket of eggs and daffodils in silver outliner, with personalised greeting.